It’s incredibly important to give back to the community in which you live and work, especially if you’ve been blessed with a fortunate life. At Bob Oates Plumbing, Sewer & Rooter, we’re fortunate to have a great team that’s constantly busy with jobs that take them all of over the Greater Seattle area. In our time serving this incredible city, we’ve noticed all sorts of local Seattle Charities that are doing incredible work to make this city a better place for all. This year, we’re planning on donating to a different Seattle Charity every month, and we decided that it’d be great to try and get some of our customers involved in supporting these noble causes. Here are the Seattle Charities that we’re supporting in 2017! We we thrilled to help support YouthCare in January! For more than 40 years, YouthCare has been a leader in providing beneficial services to Seattle’s homeless youth. In 1974, a group of concerned Seattleites started a three-bed shelter for homeless and runaway youth, the first one in the Western United States, in fact. Since then, we have grown to become a community-based agency with 11 sites serving the greater Seattle area. YouthCare helps build confidence and self-reliance by providing a range of care which includes shelter, housing, counseling, education, and employment training. Facing Homelessness is another awesome Seattle charity and we’re proud to help support them this month. The underlying mission of Facing Homelessness is just that, to remove the negative stigma against those unfortunately living in our streets by creating ‘Face to Face’ events where the community can come together to share life experiences. As a grassroots movement, Facing Homelessness hopes to spread their message by facilitating introductions that allow for a direct, meaningful connection with others. For March, our Seattle Charity of Choice is FareStart! FareStart is a culinary job training and placement program for homeless and disadvantaged individuals that was established in Seattle in 1992. Since then, FareStart has provided training and employment opportunities for over 7,000 individuals hoping to transform their lives. What’s more, in their time Fare Start has also provided over 6 million meals to disadvantaged folks in Seattle. FareStart helps empower disadvantaged folks to achieve self-reliance through life skills, job training, and employment in the service industry. In April, we’ll be donating to Emerald City Pet Rescue, a Seattle charity that aims to rescue abused, neglected, and homeless animals. They primarily pull from high-kill shelters around the country and place those pets into loving homes where they’ll live forever. Emerald City Pet Rescue saves the animals who have been in the shelters the longest and who are certain to die unless rescued. They pride themselves on providing the best possible medical care for their rescued animals while also rehabilitating hard-to-adopt animals to help them find a loving home. Certainly a noble cause that we’re happy to support! May is Tree House For Kids month! This Seattle Charity is truly unique and special. Established in 1988, Tree House for Kids was created to address the difficulty foster children often face within academic environments. In 2012, they set out with ambitious goal to combat the high dropout rate among foster children in high school. Now, thanks to the support from their donors and their amazing staff, Treehouse helps nearly 7,000 youth foster care each year through programs that help them succeed in school! In June, we’ll be supporting the Seattle Charity Labateyah Youth Home. The United Indians Youth Home seeks to create a safe and wholesome environment for homeless youth. Founded in 1992 by founder Bernie Whitebear, Labateyah combines Native American wisdom and ceremony with modern educational, medical, and social services. Having noticed that there was a disproportionate amount of Native American youths within Seattle’s homeless population, Whitebear established Labateyah (which means ‘the transformer’ in the Lushootseed language) to provide a supportive transition for homeless youth in Seattle to a life of self-sufficiency and permanent housing. In July our Seattle charity of choice is Northwest Harvest! Northwest Harvest is leading the fight for hungry people in Washington state by providing access to nutritious food while respecting the dignity of disadvantaged folks and promoting healthy habits. As the only non-profit statewide food bank distributor in Washington State, with a network of 375 food banks, Northwest Harvest is able to provide 2 millions meals every month. Northwest Harvest is entirely committed to nutrition with ultimate goal of ending hunger in Washington! They’re doing truly amazing work and we’re happy to support them! 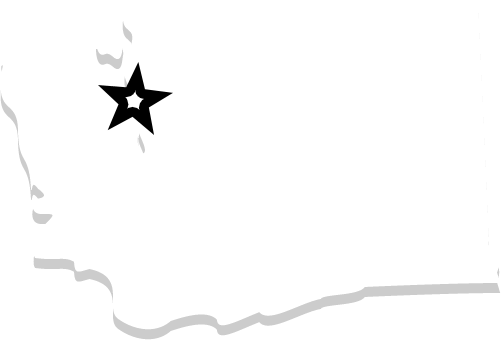 In August we’ll be donating to the Seattle charity known as the Seattle Milk Fund, which provides child care grants and family support to low-income, full-time students attending approved King, Pierce, and Snohomish colleges and universities. While parents are in school, children care and education within a licensed preschool or child care facility, which greatly helps ease the stress felt by both parents and children. Seattle Milk Fund has been helping secure families’ futures since 1907, making it one of the state’s longest running charities! In September we plan on donating to Mary’s Place, a Seattle charity that acts as a leading voice for homeless women, children, and families in emergency situations. Since 1999, Mary’s Place have offered day and night shelters to provide safety, support, and hope for these disadvantaged folks. They provide two hot meals a day, showers, laundry, health services, resources and referrals, education and support to help women move forward and out of homelessness. Mary’s Place is a truly incredible cause and we’re happy to support them in the Fall! Swedish Hospital is a nonprofit health system that has been serving the greater Seattle area for over 100 years. Since then, they’ve acted as the region’s leading healthcare provider and are consistently named the area’s best hospital, with the best doctors and nursing staff. Every year, the Swedish Foundation relies on the generosity of Seattleites to provide vital specialty care for those in critical need. Donations also help physicians find new ways to treat patients and build new training labs to teach the next generation of caregivers. They’re totally awesome! Just in time for Turkey Day, Bob Oates Plumbing Sewer and Rooter will be donating to Ballard Food Banks in November. Ballard Food Bank’s Mission is to bring food and hope to their neighbors. To achieve this, they provide access to nutritious food and services that support self-sufficiency while advocating for food equity and justice. Access to nutritious food is their top priority; individuals and families who find themselves living below the poverty level need help in having their needs met. In 2015 alone, there were over 38,000 visits to the food bank and they distributed more than 1.4 million pounds of food. Talk about heavy lifting! In December, we’re going to be switching things up a tad and creating our own toy drive here at Bob Oates Plumbing. We’re going to encourage our customers and our followers on social media to give toys, blankets, and other holiday themed items so that we can organize a nice big bulk donation. The exact specifications of our bulk donation for December 2017 still have to be determined, but we’ll likely submit a bulk donation to Toys for Tots. 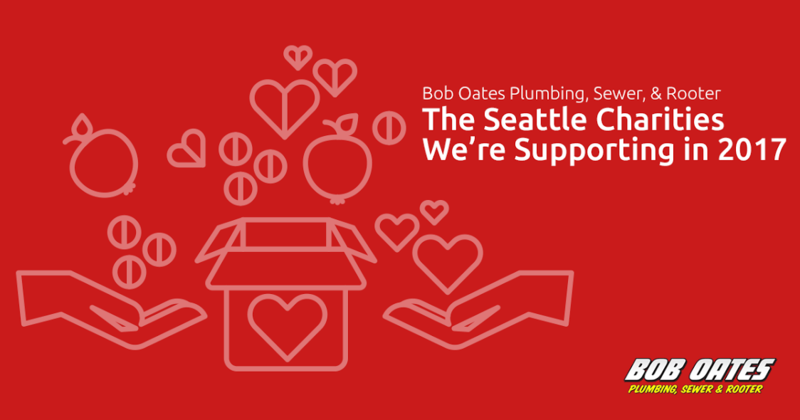 At Bob Oates Plumbing, Sewer, and Rooter we know the value of local philanthropy, and each of these Seattle charities are doing incredible work to make the Greater Seattle area a better place to live and work for all people. We think that’s great and we’re happy to support them! These organizations are all doing a great job at helping people, but if you’re interested in any of the ways that Bob Oates Plumbing Sewer and Rooter can help you with any of your plumbing or sewer needs, give us a call today!